It’s just a chair, an old chair. 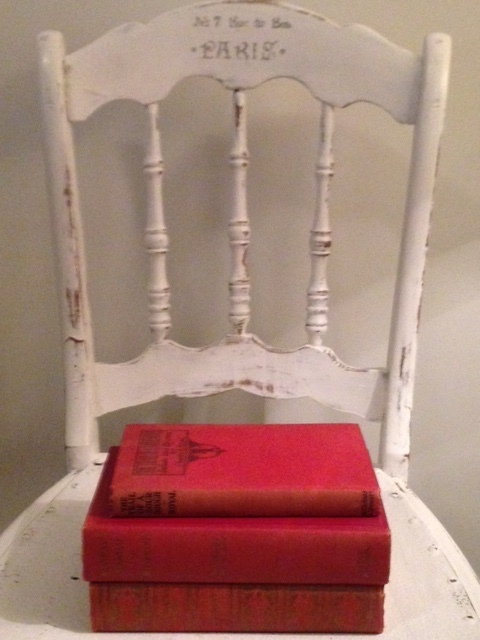 Yet, if this chair could speak; the stories it might tell. The couple who sat on them, gone. Perhaps it would share the couple’s Saturday morning plans as they prepared the necessary grocery list. Their turn to host an evening’s cocktail social for the neighbours. They were big on appetizers and scotch. Politics, quail and rose gardens. They visited France. I remember. The chair sat in the garage. I felt an overwhelming need to take a pause and notice. Lovely in its simplicity, the curved back begged touch, beckoned me to slip fingertips along the sloped top. The chair and its twin remained in a garage for several years. Ignored. Dampness set in. The wood split and greyed. The nail heads rusted and seeped.The chairs stood disgraced.They knew she’d never approve of their current state of affairs. Annie Sloan chalk paint never disappoints. I washed the grime away. Dressed in a coat as white as snowbells in early spring, the chair straightened. Pretty, fresh. After a gentle sand, the chair’s personality shone through. Paint slipped off the wood in all the right places. A buff of wax and she smiled. I remembered. As an afterthought, I applied a royalish stencil, minus the crown. Which is just as well. Enough, it’s just enough. I’ve heard it said, Paris is always a good idea. Great job on the chair.